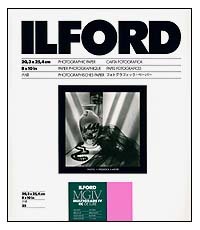 25 sheet package of Ilford Multigrade IV RC 8"x10" Glossy surface paper. Multigrade IV RC Deluxe is a resin coated variable contrast paper for making black & white enlargements from negatives. Contrast grades from 00 to 5 can be achieved using Multigrade or other variable contrast filters, variable contrast enlarger light systems, or the yellow and magenta filtration of dichroic colorheads. For detailed information on contrast control with Multigrade papers, please refer to the Ilford Contrast Control PDF.